Ho would you host a non-web based microservice? In a Windows Service or as a console application? While it’s certainly possible to host the Microservice as a console application, I recommend hosting as a Windows service. As a Windows service, you have the added advantage that your Microservice will start automatically after reboot, and can control permissions, etc., at an OS-level. You also have greater control over service failure, and how to handle restarts. Hosting as a console application, by contrast, offloads a lot of that responsibility to the Microservice itself. Can you containerize a windows service? If yes, can you please share an example? Yes, long as the container has access to the Queue. I have no working examples for this. Another follow up on this (just starting out on my first microservice in .NET) how would you code/deploy the API Layer/Gateway to microservices? Would this be a WCF service? Basically the microservice (or microservices?) is responsible for Creating, Starting, accepting bets, determine wins, support query etc. for a game? From my understanding one API gateway would expose all these methods, whereas each microservice will carry out individual tasks (Creating game, starting game, accepting bets etc.) and each microservice will point to its own individual database. But from what I have read if a microservice cannot make an async call to another microservice, then both microservices should be combined into one. Since its a gaming applicaiton, response time is of paramount importance, although I get the advantages of a queue like RabbitMQ. Hope the questions make sense? The gateway can be any mechanism that provides a HTTP entry point, to allow customers access to your application. WCF in this case is fine, although as a technology, WCF has largely fallen out of favour against RESTful services. There is no reason why each Microservice need point to its own individual database; Microservices can access a shared database without issue, although this is not a requirement. You mention communication between Microservices and concurrency. 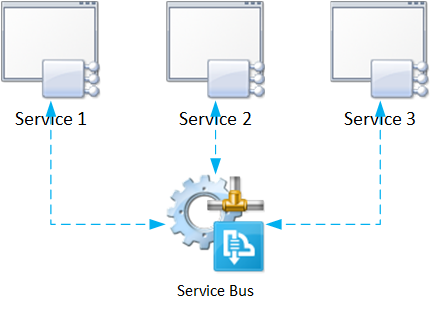 Microservices focus more on parallelism than concurrency. Each Microservice essentially runs in its own process, potentially on a dedicated resource (VM, container, etc.). Is your process workflow-based? Consider that messages can be sent to more than 1 Microservice, and that each Microservice can process messages independently. If a Microservice is reliant on another Microservice, consider building a highly available design, such that the downstream Microservice is always available, and can dispatch responses in a timely fashion. Concatenating Microservices is not prohibited either, although this is something that needs case-by-case assessment. Your blog post series on this has been really helpful for me and very interesting. I’ve downloaded the source for this from your GitHub but I’m hitting some issues when running it and was wondering if you could advise? If I run the website and just simply let it sit there, eventually (after a couple of minutes), the RabbitMQAdapter falls over in the “Publish” method. This is happening even though no messages are (as far as I’m aware) being posted via the website so I’m left to assume the micro-services are doing something? The error occurs on during the CreateModel call and says there is no active connection. Checking IsConnected shows that it is currently disconnected. However a deeper dive shows that before the CreateModel method is called IsConnected is true. The AMQP operation was interrupted: AMQP close-reason, initiated by Library, code=541, text=”Unexpected Exception”, classId=0, methodId=0, cause=System.Collections.Generic.KeyNotFoundException: The given key was not present in the dictionary. I don’t suppose you’ve seen/resolved this or know what might be causing it if it’s actually a client/consumer side issue? Thanks again for a great set of blog posts, hope you can help. Hi Nik, can you confirm that your Queues and Exchanges are configured as being durable? Apart from RabbitMQ do we have any other library to get micro services created? No, but the library is designed in such a way as to provide a level of abstraction above RabbitMQ. You can implement your own implementation that will satisfy any consuming client. Can you explain more details? I am new to Microservices architecture. As you explained “Microservice.cs” is an interface which is implemented by Microservice. Does each Microservice has its own interface or can we share same interface with each Microservice? The same rules as regards applying interfaces to any code base also apply to Microservices. Apply interfaces as and when needed. Generally, interfaces are required as contracts between Microservices where proxy-based communication is used.